A nearly perfect mobile marketing plan and follow-up execution will fall short if the underlying app is uninspiring, bug-ridden or unremarkable. In addition, a well-designed, compelling app thrown in the mix of 50,000+ apps and unsupported by marketing, would likely disappoint. An integrated approach is most effective, with all components complementing and leveraging one another. A commitment to an integrated marketing plan and continued improvements to the app itself, will increase your probability of a sustained advantage in the marketplace. Get noticed in the App Store. Prospective customers often browse within the top apps listed in the app store via iTunes on their computer or via the iPhone App Store app. Your app’s ranking is affected by unit downloads and getting into the top 100 can dramatically impact the success of your app. Choose a unique, catchy name for your app so that yours can be found within the app store easily and within Google searches. Include your brand name, where appropriate. Be sure to do your homework and scour the apps store to see what your competition is doing. Your app name in the app store should include keywords and be longer than the app name on the phone itself. If Apple continues to allow, you can see how renaming your app or modifying your app description copy and screen shots affects your ranking in the days that follow Apple approval. Submit to app review sites. Submit your app for review. Provide a promo code so that the editorial staff can review your app without having to pay for it. Here are some of the leading app review sites: AppCraver, 148apps, AppVee, iPhoneAppReviews.net, iUseThis, Apple iPhone School, AppStoreApps.com, iPhoneApplicationList, TUAW and Apps Safari. Reach out to Rob, the host of the popular PodCast TODAY in iPhone. He’s been generous in the past with reviews of new apps. Establish yourself as a subject matter expert and develop mutually rewarding relationships with the media. Odds of a feature story, pick-up or mention increases exponentially as your goals are aligned to that of the columnist, radio host or TV producer. Developing rapport is easier than you might think. In fact, you can respond to a daily feed of reporter requests for expert sources using HARO. Regarding pitches and press releases, don’t be ordinary. You need to stand out from the crowd to be remembered. Peter Shankman, one of the most respected names in PR drives this point home in his book, “Can We Do That?” Distribute only to media contacts known to cover your topics. Online PR distribution gives you access to newspapers, radio, TV, industry trade publications, consumer magazines and influential blogs. Reach out to editors, journalists, news directors, producers and industry analysts. Web syndication drives immediate exposure of press releases to web-channel publishers internationally. Today’s technology can monitor media mentions/pickups and provide insightful analytics about traffic sources. Be sure to bunch up your publicity when you go live to maximize your chance of top ranking by app category. Customize your business postage stamps using your new app’s icon design. Promote from ads within other apps. Promote your app in interactive ads contained within other iPhone apps. iPhone ads offer very high levels of engagement including click to call, click to video and click to app store. A growing number of ad networks provide in-app advertising options with audience targeting that includes age, gender, geography, category, carrier, device and handset. Pricing models include bid per click and per engagement. Conversion tracking and reporting are standard offerings. Check out these folks: Medialets, Quattro Wireless, AdMob and VideoEgg. Where ever you promote your app online, increase your traffic and page rank using an AddThis button. It’s easy to install on your blog or website pages and it makes it easy for your visitors to share your content with their friends and colleagues who use Facebook, MySpace, Digg, Delicious, LinkedIn, TypePad, Blogger, WordPress, etc. Choose your advertising targets wisely. As yourself these questions: Who are my best customers? What are their demographic and lifestyle characteristics? Where do they gather? How do they consume media? What do they read, listen to and watch? Should my advertising be placed where captive mobile audiences can be found (train stations, bus stops, airports, amusement parks, checkout lanes, hotels, college campuses, cafes, within other apps, on podcasts, etc.)? And, what analytical tools will measure the success of each? 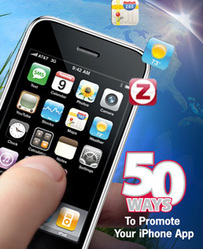 View MacWorld’s iPhone App Marketing Program slideshow as an example of paid sponsorship and advertising. Some of the app review websites listed in #2 above offer advertising on their sites. Your online ads can link directly to your app within the app store. Wizzard Media provides access to sponsorship/advertising opportunities within audio/video podcast content categories relevant to your target audience. Think differently: Large ad display stickers are gracing the ceilings on commuter CTA trains in Chicago and oversized floor stickers are becoming commonplace at trade shows and retail establishments. Larger budgets can consider outdoor options that include wallscapes, train/bus wraps, transit stations, etc. Titan Worldwide offers outdoor advertising in many of the world’s top markets. Promote mobile app within current customer touch points. Promote your new app on your store receipts, packaging, shipping flyer insertions, apparel tags, shopping bags, invoices, monthly statements, envelopes, packing slips, POP displays,posters, restaurant menus & place mats, shipping containers and custom imprinted packing tape. Create attention-getting stickers for use on each, where appropriate. Participate in targeted app topic-specific Q&A discussions at Yahoo Answers, LinkedIn Answers and WikiAnswers and provide links to learn more about you and your app. Become a trusted participant by providing answers to others. Send out a highly targeted email campaign to prospects. You’ll want your campaign to be CAN-SPAM compliant to avoid fines and/or criminal penalties. B2B and B2C email lists are available from infoUSA.com. Filter from 2 million business email contacts by industry, SIC, size, job titles, spending, credit rating, location and more. Filter from 15 million consumer email contacts by geography, age, home value, wealth indicators, hobbies & interests, ethnicity, religion, household occupant info and more. Many publications have databases of subscriber email addresses and will send email campaigns on your behalf. They, too, allow filtered targeting of their email lists. Choose publications whose audience matches your targeted customers. A warning about buying or renting email lists, follow the rules and stay current on new developments. Email marketing platforms such as the popular Constant Contact have a no tolerance spam policy which you can read here. Learn from the success of Peggle. On June 11, 2009, they dropped their price from $4.99 to $0.99 for a three day promotion. The results are in…on June 16, 2009, Peggle achieved ranking atop the app store due to the popularity of the app during the promotion and it is selling at the original $4.99 price. Such a strategy requires effective publicity around the promotion. AppVee, an App review site, setup a separate AppVee Twitter “Apps Now Free” account for tweets to their followers about price drops. Create presentation walk-through of mobile app. Create and upload a SlideShare.net presentation that includes a slide show walk-through with screenshots of your app and a description of features and benefits. Supported upload formats include PowerPoint, OpenOffice, Apple Keynote, Microsoft Word, Microsoft Excel, iWork Pages and PDFs. Share publicly and optimize text content (title, description, etc.) within your posting to optimize search engine placement. Secure a launch sponsor and co-promote. Examples include People Magazine’s app and its launch sponsor Unilever. Within your pre-launch marketing materials, promote and provide clear instructions for those who might be interested in being a launch sponsor. Explain the benefits they’ll receive in terms of publicity exposure, placement within the app and other perks. Get creative with the extra perks. For example, let’s say you’re a celebrity speakers bureau…you can offer an opportunity for your sponsors to enjoy an evening meeting a few celebrities. Within your app, include a conspicuous “Tell a friend” feature and leverage the users’ personal iPhone’s contacts directory for text messaging or email. Pre-populate the message with friendly promotional copy that speaks highly of your app and provides a link where they can learn more. Within your app, create a Twitter update feature so that users can easily tweet about the awesomeness of your app. Suggest a few pre-canned complimentary messages and append with a TinyURL that links to your app in the app store. Include and promote exclusive content within your app that is unavailable elsewhere. Use 2D mobile barcoding in your advertisements, product packaging and other customer touchpoints. 2D barcodes can be scanned with camera phones. To get a sense for the power of this technology, try the following: 1) Create a QR Code here or here. 2) Download the Optiscan iPhone app ($4.99) or another QR barcode reader app. 3) Scan the code. Are you amazed? Here’s where it gets good…the scanned barcode information can provide a link directly to your app in the iPhone App store! The user is provided with a web link, phone number or message that’s saved directly onto the phone. This is an emerging advertising technology in the USA but has been in use in Japan for some time. Its permission-based format is attractive to consumers. Below notice a QR barcode that contains my contact info. Once scanned to the iPhone, two clicks adds a new contact record that includes my full name, phone number and email address. Note: If you use QR barcodes, better to display larger vs. smaller. Some mobile cameras cannot focus properly to get a good read if the barcode is too small. Add new features to your app over time. Feature upgrades create new publicity opportunities and updated ranking by Apple within the app store. Along with improvements, monitor your app’s review feedback and act upon insightful new feature requests to keep customers coming back and lure new ones into the fold. When your app is developed, include mobile analytics so that your can learn about how your app is used, referring sources and app performance characteristics. Within your app, you can include a few simple features. A “Send Feedback” button can send emails to you privately. Another button labeled “Leave a Review on iTunes” would provide easy access to app review submission. Find businesses who target similar markets to yours, but are not considered to be competitors. Reach out to influencers that specialize in the field that relates to your app. For example public speakers, book authors and other thought leaders are wonderful allies for collaboration. How can you get them talking about your app to their captive audiences? What can you offer them in exchange? Don’t forget about the media. A personal phone call or hand written note can go a long way towards building those relationships. Enthusem offers personalized greeting cards with your images and text. The cards are physically mailed on your behalf and include your return address. What’s interesting is their pickup attachment feature. A pickup code is provided to the recipient to access your uploaded file (PDF, PowerPoint, video, etc.). You are immediately notified when your recipient uses the pickup code. Announce to friends, associates and connections across your social networks: Twitter, LinkedIn, Facebook, MySpace, etc. Other social networking sites are listed here. Get listed in free online directories such as DMOZ. DMOZ powers core directory services for some of the most popular portals and search engines on the Web, including AOL Search, Netscape Search, Google, Lycos, HotBot and hundreds of others. Post an announcement about your new app to your blog. Create a blog if you don’t already have one. WordPress or Blogger are good choices and they’re free! The analytical reporting provided reveals your referring traffic sources and an indication as to which of your blog posts are most popular. Ask Google to consider adding your blog to Google News (complete submission form here). Be sure to integrate your blog into LinkedIn (click on Applications) and Facebook (Simplaris Blogcast). Setup a Facebook Fan page to showcase your new app. It’s free and easy and your page can be found publicly in the search engines. When people join your Fan page, it’s published in their news feed for all their friends to read. It’s a great viral marketing tool! Create trial and paid app versions. Content optimization for improved search engine rankings. Using Google Adwords keyword tool or Google Insights for Search, research search terms that are most relevant and popular with your target audience and populate your app description with those terms. Use the highly targeted terms consistently throughout all of your promotional efforts, including your blog and YouTube tags and app website META tags. Showcase app in new website. Create a new website to pre-market and showcase your app. Include screen shots and describe the features and benefits. Search optimize the website content. Reserve a custom domain name. Within your existing website, create a section to promote your app. Link to your app within the iPhone App store. Promote your app throughout your website with a button, “Available in the iPhone App Store.” Add a forum feature to solicit contributions from your customers. Moderate feature requests and customer feedback. Mention your new app in your monthly newsletter and/or email blast to your database of customers and prospects. Create a YouTube video about your new app. Set up an account for free. In your video, highlight the ease of use, features and benefits. Your YouTube Channel can include a collection of your own videos and a memorable URL as well. Tag each of your videos and your channel with highly targeted terms. YouTube provides analytics insight regarding the number of views, visitors by demographic and popularity. Visitors choose to become friends and subscribers. You can choose to display visitor comments and attach your existing blog. Promote your YouTube app video with a your own sponsored ad within YouTube. Ads appear in the search results along the right side of the page. This is managed through a standard Google AdWords account. Exchange ad space within mobile apps. Use AdMob Download Exchange. Allows new users to discover your app from inside hundreds of other apps. On LinkedIn, join up to 50 of the 280,000+ groups that meet your target audience criteria. Within those groups, click on the News tab and post a link to your press release or blog posting about your new app. Within your LinkedIn profile “Websites” section, link to your website showcasing your app. By choosing “Other” as the website type, you can customize the name you use to identify your app. Identify forums that meet your target audience criteria. Participate in discussions and promote your new app as appropriate. Be sure to follow each forum’s protocol. Try paid search marketing – Examples include Yahoo Search Marketing, Google AdWords and Live Search. Your ad can point to a destination of your choice. Link to the iTunes store where the app can be purchased. To do this, open iTunes and hold your Control key down while clicking on your app’s icon. Then choose “Copy Link.” When you past the link code, it will look something like this: http://itunes.apple.com/us/app/zagat-to-go-09/id296428490?mt=8 You can also link your ad to your app website, SlideShare presentation or YouTube app video. Leverage existing presentations and sell sheets. Append your company’s PowerPoint presentations and sell sheets to include a mention of your new app. Embed your PowerPoint within your LinkedIn profile (use the Applications feature). If you’re already sending direct mail to customers and prospects, set aside some real estate on your next mailer to promote your new app. Consider a new direct mail campaign to targeted prospect lists using high quality sales leads. USADATA offers access to 14 million businesses and 132 million households. Business lists are available by industry, SIC, size, job titles, spending, credit rating, location and more. Consumer lists can be filtered by geography, age, home value, wealth indicators, hobbies & interests, ethnicity, religion, household occupant info and more. When making your targeted list selections, it’s helpful to refer to a profile of your best customers within each targeted segment. Create branded promotional items (T-shirts, pens, mugs, cards, etc.) for your customers and prospects. Promote both your company and your new app. Do it yourself at CafePress. Tell friends, relatives and colleagues. Give them a small stack of business cards whose design and sole purpose is to specifically promote your app. Include a QR barcode as described in Tip #17 above. Send out an announcement to everyone in your address book. How can you encourage them to share with their contacts, too? Announce at your community chamber events and within their new announcement opportunities on their website and in email blasts to their membership, etc. Excellent customer service with users of your app will earn their respect and recommendation. Voice mail and on-hold messaging. Change your outgoing voice mail message to include a mention of your new app. Change your company’s “on-hold” audio message to include a mention of your new app. Encourage associates at your company to mention the new app as they are in conversation with customers and prospects. Design a roll-up banner to promote your new app at your next trade show or within your establishment. Create a highly targeted opt-in SMS campaign. Submit your app article or video online at Digg.com. Your submission will immediately appear in “Upcoming Stories,” where other members can find it and, if they like it, they’ll Digg it. Once a submission has earned a critical mass of Diggs, it becomes “popular” and jumps to the homepage in its category. Try free classified advertising on CraigsList. Host an App Launch Party. Celebrate your launch with friends, associates, prospects and customers. Many bakeries now offer edible photo cakes or you can make one yourself. The cake icing can include your app icon. Order custom imprinted balloons with your app logo. Create wallpaper/background image made of columns and rows of your app’s icon and use on your profile pages in MySpace, Twitter, etc. Create promotional gift wrapping and tissue paper made of columns and rows of your new app’s icon. Find creative ways to use the wrapping and tissue paper. Branded promotional items with a mobile theme. Give away imprinted cell phone shaped mint tins with your company and app information. Append your email auto-responders to include a mention of your new app. Consider using location-based mobile social media apps that reveal people nearby with similar interests. One such app is Loopt. Within the Mix tab of the Loopt app, setup your profile to include “About me” text as well as Tags that represent your areas of interest. Other subscribers set up Filters by age, gender and Search Tags. When appropriate, you can send a message to nearby Loopt subscribers that you think might have an interest in your app. Use indoor and outdoor image projection to promote your app icon. Update company profile in professional directories. Consider creating or updating your company’s profile information across online company directories. Include a mention of your mobile app, where appropriate. Don’t forget data aggregators like InfoUSA and individual websites where your company profile can be included such as LinkedIn.